As of 2016, the quintet in this formation has two albums out. Both are part of the Orchestrotica's Exotica for Modern Living Series available in our online store. The sound of the Orchestrotica’s quintet also exists in two albums that help form the larger Exotica for Modern Livings Series, which launched in 2010 with the group’s big band ensemble performing it’s transcriptions of the lost music of Esquivel. In June 2011, the quintet released Third River Rangoon, it’s first interpretation of exotica as a mélange of jazz, classical, and world music. This sound matured with the band’s sophomore recording, Where Here Meets There (2013), a dichotomous album that introduced even more adventuresome original music on it’s A-side (“Music from Here”) and the group’s most sophisticated adaptations to date on it’s B-side (“Music from There”), the latter including it’s popular arrangements of Gershwin’s three “Piano Preludes.” The series has also been lauded for its unique mid-century modern-inspired artwork, and audiophile-grade production quality. In addition to O’Neill’s vibraphone and hand percussion, the quintet features Geni Skendo’s bass flute, flute and shakuhachi, the highly stylized classical/jazz bassist Brad Barrett, Tev Stevig on the rare trio of oud, tanbur, and resonator guitar, and Jeremy Smith who referees the ensemble’s interactions and improvisations using a bounty of percussion from marching machines to Arabic frame drums. All of the musicians are teaching artists and the ensemble provides educational programs at the primary school, high school, and collegiate levels. Get on the mailing list to get updates on our shows and events for both groups! Brian O’Neill is a versatile multi-percussionist, drummer and composer based in Boston, MA. 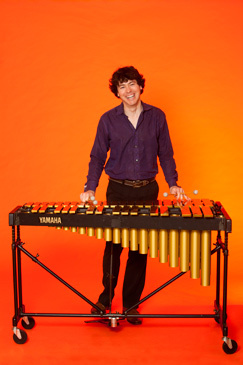 A “percussion master and musical polymath” (Boston Phoenix), Brian performs regularly in a wide variety of musical contexts including western classical orchestras, musical theatre, jazz groups, and world music ensembles. Brian is also the Artistic Director of Mr. Ho’s Orchestrotica, the internationally acclaimed dual-ensemble that includes two incomparable ensembles: the world’s only Esquivel Megaband performing Brian’s transcriptions of Juan Garcia Esquivel’s lost space-age pop music (“deliciously entertaining”Wall Street Journal), and a global jazz and exotic chamber music quintet that interprets Brian’s original compositions and radical adaptations of classical works (“engagingly unique”Boston Globe). The Orchestrotica has released three albums in its Exotica for Modern Living series, all of which have received critical international acclaim including a “four star” review from the Sunday London Times, and two “Top 10 Albums of the Year” awards from the Huffington Post. AllAboutJazz once said, “O’Neill may be, in the long run, a better exoticist than [John] Zorn,” and his music with the Orchestrotica has been featured in film and on stages in Canada, Mexico, Germany, and across the United States. As an orchestral and chamber musician, Brian has worked with Portland Symphony, Albany Symphony, Boston Modern Orchestra Project, Arizona Opera, cordis, and as a soloist with Sun City Symphony in AZ. Brian is also a show drummer and percussionist, and has performed with Kristin Chenoweth, Donna Summer, the national tour of Motown the Musial, and as a regular drummer at North Shore Music Theatre in Beverly, MA. Additionally, Brian has a love for world music and is a regular performer with Ishna (Celtic/Irish, bodhran, drumset), Klezwoods (klezmer/Balkan, riq, doumbek, cajon, drum set), and Jeni Jol (Balkan/Turkish, frame drums). His musical adventures have brought him to national and international stages including The Montreal Jazz Festival (main stage), The Kennedy Center, and Carnegie Hall among others. Orange photo by Robin Holland. The Boston Globe calls flute and shakuhachi specialist Geni Skendo a “virtuoso,” creating a unique blend of jazz, free jazz and world music. After a successful performing career in his native Albania, Geni moved to the US in 2003 to raise his jazz playing to a higher level. Studies at the Berklee College of Music and The New England Conservatory (MM) led to a deep, ongoing involvement with the Boston music scene. Geni performs with Mr. Ho's Orchestrotica (Best World Music Act, Boston Phoenix Readers’ Poll, 2012), in both its quartet and big-band incarnations. The quartet utilizes Geni’s full palette, while The Esquivel Megaband relies heavily on Geni’s powerful bass flute in its recreation of long-lost arrangements by the legendary Mexican arranger Juan Garcia Esquivel. Geni also leads the free improvised chamber music group, Samurai Jazz Trio, consisting of shakuhachi, bass/shamisen and piano. Geni has released three CDs, most recently Acoustic Cowboy, featuring original compositions and new arrangements of songs from Olivier Messiaen, African pygmies and the Balkans. 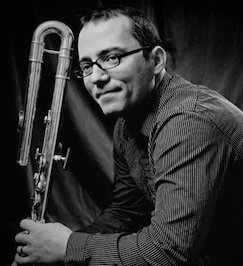 Michael K. Harrist is a musician and educator based in Watertown, MA. Michael performs and works with artists in a wide array of world traditions including Turkish art music, Hindustani music, Jazz, Western art music and American roots music. He has performed throughout North America, Europe and Turkey with various ensembles including Ameranouche, Cesni Trio, Ross Daly and Kelly Thomas, Sol & Kiel, Capillary Action and the Labyrinth Modal Music Orchestra. Michael teaches workshops and private lessons in world music traditions (primarily Turkish makam and Hindustani raga), monophonic and polyphonic composition and instrumental practice and performance. His workshops for children focus on pitch and rhythm acquisition through games and play. 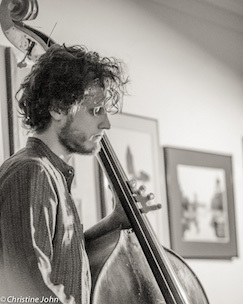 Michael studied double bass with James Macdonald at the Open Music Collective in Brattleboro, VT. He received his BA in music and religion from Marlboro College under the tutelage of composer Stan Charkey and religion scholar Amer Latif. Michael continues his studies with composer W. A. Mathieu, sarangiya Pandit Ramesh Mishra, sarodiya George Ruckert, neyzen Fred Stubbs, and contemporary modal musicians Ross Daly and Evgenios Voulgaris. 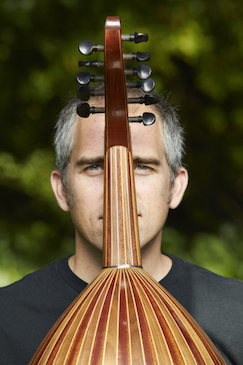 Tev Stevig is a Boston-based guitarist and multi-instrumentalist, specializing in a variety of pluckedstring instruments from the Balkans, Greece, and Turkey. He joined the Orchestrotica's quintet in 2013 and had been playing guitar and steel guitar with the group's 22-pc Esquivel big band since 2011. Tev also performs with his solo/duo project called Jeni Jol, which incorporates elements of music from the Balkans, Greece, and Turkey in his original compositions and arrangements for clawhammer style fretless guitar. Jeni Jol's first CD was released in the fall of 2013 and is the first of an exciting new series of CD releases featuring solo clawhammer style guitar. Tev also plays electric guitar and oud with the klezmer/Balkan/jazz/rock band Klezwoods. He plays tanbur with the Ottoman art music group Orkestra Marhaba and acoustic guitar and oud for the Balkan/new-grass group, Hickory Strings. His musical travels have brought him to the main stage at the Montreal Jazz Festival, the John F. Kennedy Center in Washington DC, the Apollonia Festival of Arts in Bulgaria, as well as many other music venues in North America and Europe. He has performed with such seminal Balkan folk artists as Yuri Yunakov, Goran Alachki, Gieorgi Yanev, Adam Good, Beth Cohen, and Walt Mahovlich. He has also performed with Ramon de los Reyes Spanish Dance Theater, Julia Madeson and Aljashu (Sephardic music), Zamir Chorale, and the Turkish art music ensemble, Dunya. Jeremy Smith is a percussive artist whose unique versatility allows him to move seamlessly among numerous musical styles from around the world. While the foundation of his playing comes from his classical training at Juilliard, his passion lies in improvisational percussion traditions such as those found in South America, Africa, India, the Middle East, and jazz. He has performed with ensembles and artists such as Alí Bello and the Sweet Wire Band, Ensamble a Contratiempo, Gerardo Contino y Los Habaneros, Gian-Carla Tisera, Los Crema Paraiso, and Latin Grammy nominee Luisito Quintero. He is also a member of the innovative Middle Eastern music group Brooklyn Nomads led by oudist Hadi Eldebek. 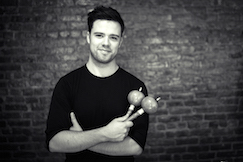 As a composer, Jeremy has written two works for percussion trio. “In Unison” was written for and premiered by students at the 2013 Juilliard Summer Percussion Seminar. In 2012, he premiered “5-7-9” at Juilliard’s electro-acoustic concert series Beyond the Machine 13.0. This work has also been performed at the Manhattan School of Music and had its Asia premiere in July 2014 at the International Percussion Festival in Seoul, Korea. Jeremy is an active freelance artist based in New York City where he is also an accompanist for modern dance classes at Peridance Capezio Center, Steps on Broadway, Paul Taylor School, Ballet Tech School, and Harkness Dance Center. He received his Bachelor of Music degree from The Juilliard School as a student of Gordon Gottlieb and Markus Rhoten.